The Algarve is a stunning location and and our Vilamoura Luxury Yachts are the perfect way to experience all Algarve has to offer! 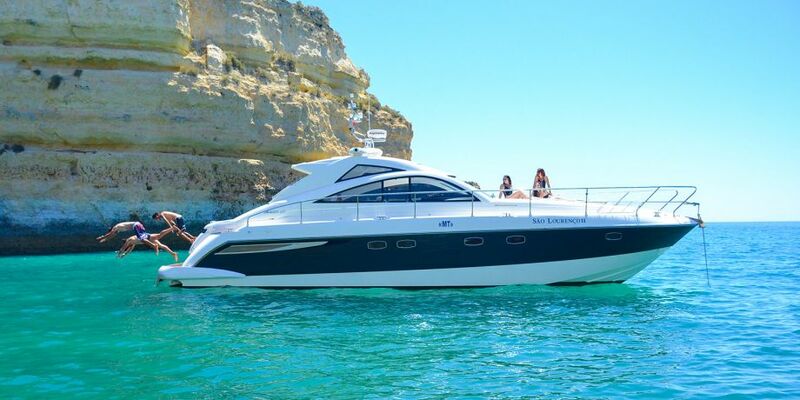 Take a private cruise along the Algarve’s spectacular coastline on one of our Vilamoura Luxury Yachts! We invite you to explore beautiful beaches, impressive rock formations and cliffs some of the Europe’s largest caves! Likewise, you’ll get to see quaint fishermen’s villages and interesting cities and towns! 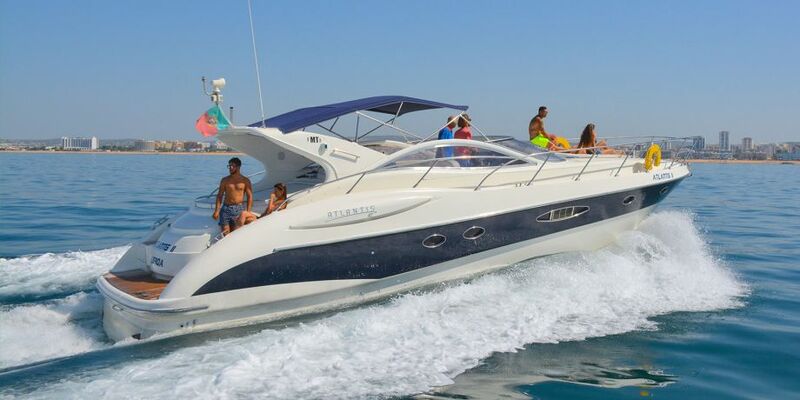 Why book our Vilamoura Luxury Yachts? Our Vilamoura Luxury Yachts will cater to your every need! Enjoy cruising along with your friends and family! Celebrate a special event in style with a refreshing drink in your hand! We LOVE organizing everything from romantic cruises for 2 to fun stag and hen do’s and even birthday celebrations! Let us know how many people are in your party – we will send you a specialized brochure with the most suitable options! Tell us what you are celebrating! Wanting to see any particular sights? Let us know! In this case, we can tailor the cruise to your personal requirements! Limo transfers ensuring the ultimate VIP experience! Water sports packages for the more adventurous! Specialized catering for those looking to enjoy maximum time on board our yachts! Above all, we want to make sure your planning is stress free, so contact us at portugalsportandadventure@gmail.com and we will help you plan your ideal Vilamoura Luxury Yacht charter from start to finish! Our luxury RIB features 2 sunbathing areas and is equipped with a fridge to keep your drinks cool and she even has her own fresh water shower so you can rinse down after a relaxing swim in the sea. It is also the only RIB boat in Portugal with it’s own bathroom! Being smaller than our luxury yacht, this is the perfect boat to charter for a visit to the Algarve’s most secluded beaches as she can navigate all the way to the shoreline. Many of the Algarve’s best beaches can only be reached by sea so if you really want to get away from the crowd, our luxury RIB is for you. 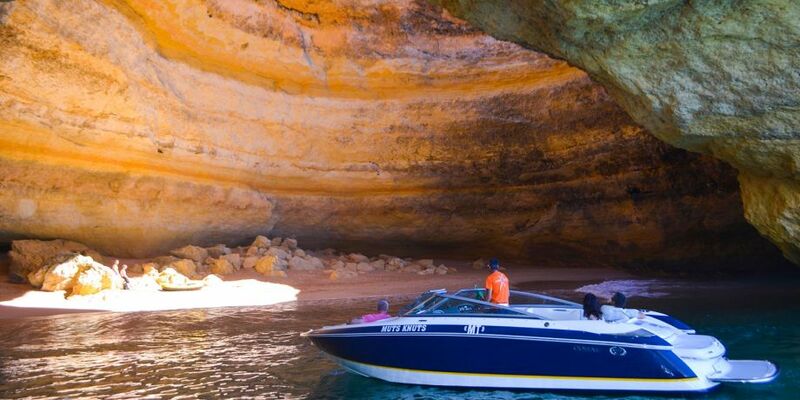 A boat trip with friends or family to see Algarve’s famous caves is another fun thing to do on our luxury RIB. Alternatively, why not see Algarve’s celebrated sea life on a luxury dolphin watching cruise! You may think that chartering a luxury RIB would be more expensive than chartering a normal tourist boat from the Marina but we believe you will be pleasantly surprised at the fantastic value a boat trip on our luxury RIB represents. On board, you will have your own captain and waiter to take care of you and you definitely won’t be crammed into a small vessel with lots of strangers. New to our fleet is this spacious and modern luxury yacht – the largest in Vilamoura! We offer a variety of fun options, starting at 50eur/person! Drinks and snacks included in all of our charter rates! Suitable for a maximum of 8 people, this charter includes Portuguese Champagne, White wine, Rose wine, beer, soft drinks, waters and light snacks. Taking a maximum of 8 people, our charter includes Portuguese Champagne, White wine, Rose wine, beers, soft drinks and light snacks. The sophisticated and sleek Atlantis is ideal romantic trips for two, or bigger groups of friends or families of up to 10 people! With a sleek exterior and spacious deck space and conmfortable interior, this is a great option to relax and travel in style along the Algarve coastline with a glass of champagne! This luxury yacht is a wonderful option for groups of up to 10 people! With a spacious interior and ample deck and exterior, you can enjoy sunbathing with a cool glass of bubbly! Also equipped with a RIB speedboat, you can enjoy a variety of watersports like Wakeboarding, Water Ski and Inflatables! Our luxury speedboat offers an impressive ride for anyone looking for a bit of adrenaline! Join us on board this beautiful speed boat across the Atlantic waters overlooking the breathtaking Algarve Coastline. Hire this speed boat by the hour and we guarantee you will have an amazing experience! Enjoy activities onboard such as wakeboarding, water ski, inflatables, among many other watersports!